Hungerford Properties has purchased two major Vancouver industrial sites which it plans to redevelop with mixed-use commercial and retail. 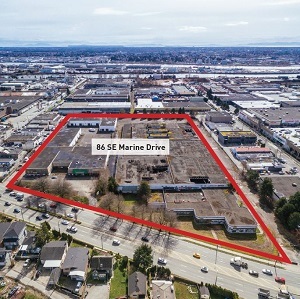 One of the properties, a 12-acre site in South Vancouver, is considered the largest industrial acquisition in the City of Vancouver in a decade. Michael Hungerford, partner with Hungerford Properties, said the two sites in South Vancouver will be redeveloped in conjunction with the City of Vancouver to create new employment-generating opportunities. “We will be exploring all options in the coming months and will announce redevelopment plans as they evolve,” he said. “We will be working hard to transform the sites from single-use to large-scale, mixed-use commercial developments in the coming years. The two large industrial sites in South Vancouver total 15.5 acres. One site is 12 acres at 86 Southeast Marine Drive and the real estate firm said it’s the biggest industrial acquisition in the City of Vancouver in the last 10 years. It was formerly owned by Walmart and previously a Dueck car dealership. The site is the biggest developable parcel of industrial land in South Vancouver and has been vacant for about 15 years. “It’s a very large, high-exposure piece of land that once developed is really going to invigorate the whole neighbourhood,” said Hungerford. “It’s going to have a much bigger impact around the whole South Vancouver commerce. “It’s industrial zoned which has some large format retail overlay as far as city policy is concerned. Predominant uses we envision there are going to be a wide range of industrial and office uses. It will be representative of the market. Logistics. Distribution. Manufacturing. A few blocks west of that site, Hungerford Properties also purchased a three-acre property at 396 Southwest Marine Drive. It is currently home to the KIA Vancouver car dealership. Hungerford Properties says the transit-oriented redevelopment site at Yukon Street and Marine Drive is one of the few remaining sites in the area envisioned to permit retail and commercial uses to service the neighbourhood’s new residential developments. The KIA site is located across from the Marine Drive SkyTrain station and is in the heart of the new retail hub at Marine Gateway. Hungerford Properties said the neighbourhood has grown by 20 per cent in the last five years and is projected to see additional population growth of about 12 per cent by 2021 and 28 per cent by 2026. This site is slated for retail and office uses and a higher form of density, said Hungerford. “The completion of the transit station, as well as the highly successful residential, mixed-use hub surrounding it, has created a push for further densification in the area to service new residents, workers and visitors,” said Darren Cannon, executive VP at Colliers. “Hungerford’s two, new strategic development sites will be able to capitalize on transit ridership numbers which are at an all-time high, and will transform the area with newer, better and denser commercial uses, ultimately bringing in more jobs, people and economic benefits to the area. Matthew MacLean, senior vice-president at Cushman & Wakefield, said the Hungerford acquisitions will kick-start a commercial revitalization in the area to complement the increased population density. Hungerford said the redevelopment of the both sites will generate an exciting opportunity for growth in the neighbourhood. “It’s going to be evolving over time as we get market feedback and we work with the City of Vancouver, in partnership with the City of Vancouver, on their vision for the uses for those properties. It’s safe to assume a significant amount of commercial density and employment density which is a good story for the neighbourhood and a good story for Vancouver,” said Hungerford. Vancouver’s industrial real estate market is currently booming. According to commercial real estate firm CBRE’s fourth-quarter 2017 report, average asking lease rates for industrial space of $10.23 have broken the $10-mark for the first time in Metro Vancouver history. This 13.7 per cent increase from 2016 ($9) is well above the average 4.3 per cent increase Metro Vancouver has experienced since 2012 and marks the sixth consecutive year of rate growth. The report said the Metro Vancouver availability rate of 2.3 per cent continues to be the second-lowest in North America, trailing only Toronto at 2.2 per cent. There were 1,364,356 square feet of new supply delivered in the fourth quarter of last year, the highest amount since the end of 2009, and 97.2 per cent of the space was pre-committed prior to product completion. CBRE said the high levels of pre-leasing combined with increased size of user requirements means availability and vacancy rates could continue to decrease while annual absorption regularly outpaces new supply. “The macro story in Vancouver and the strength of the economy is reflected in vacancy rates for the industrial product and the scarcity of industrial land only exacerbates that – that pressure to find new product and supply,” said Hungerford. “So the development of both of these sites is going to help in that regard to creating more supply in the market which is needed for companies that need to be close to service big, densely populated areas of the city. Hungerford Properties invests, manages and develops real estate across Western Canada. It has developed and refurbished millions of square feet of real estate across Western Canada in asset classes ranging from residential, multi-family, and industrial, office and retail.